Randy Pausch has been an inspiration to many in the world of engineering. Here is a video of his Last Lecture at the CMU in September this year. He will surely be remembered for many generations to come. Run the IT department like a profit and loss center. Generate ideas for business growth and work with a business unit head to implement them. Solve business problems. "You want executives coming to you with IT issues and issues that have nothing to do with IT because you're a good problem-solver," says Stephen Pickett, vice president and CIO of transportation services company Penske. Want to become a CEO? Start Running! Here is something I read a year and a half ago when my good friend KK shared this. Are you a CEO, or an aspiring CEO? If so, this article is for you. The author of this article compares long distance running to a CEO's yearly and quarterly targets. Having been running (though not as regular as my team mates at Chennai Runners) long distances for the past year and more, I've seen a lot of what is told in this book to be true. I'm sure you will be able to appreciate the content and the insight. Should you be interested to start running, do write to me! Here is the article. Read it at leisure. There is an unconference for yahoo! pipes hackers and hobbyists happening this weekend in Chennai. Its called pipesCamp. Looks like an interesting one, and I'm thinking of attending this. No! I'm not that much into coding using pipes, but I'm sure there are going to be a lot of geeks there, and a good place to network and explore. More reading on pipes? Go here. Want to join the fun at pipesCamp? Go here to get the directions. Illustrative way to trigger multiple new product innovations? I bumped into this picture today in one of the email forwards (so, email forwards are not always junk!) This caught my attention. Sometime back in my article on Art and Creativity, I had talked about the ways art can trigger creative thinking and synergies between the two. 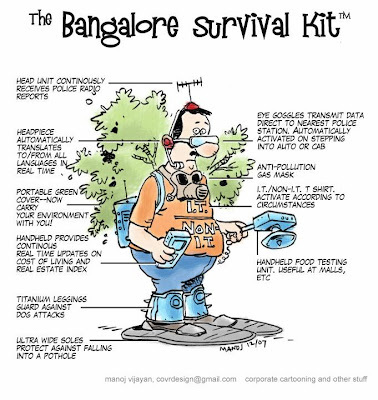 Here is a very good example of how the artist (Manoj Vijayan) amazingly imagines the ways one needs to get equipped before stepping into the roads of Bangalore. This is an excellent example of how human observation, the human brain and the environment can influence the creative output of a person. Does this trigger multiple technology product ideas in you? This is what I term as the Cascade of Creativity. Every creative work triggers a cascade of more creative ideas. Long live the Creative ind! "We all are a victim of our own forgetfulness! Most of our weekdays are spent at work, and weekends with our families and other social commitments. Our mind is always occupied with some thoughts about tasks, to-dos, etc. Most of us do use credit cards to use at many point of sale counters, fuel, phone bills, and so on. Have you ever wondered how the credit card business makes money? This is where the Business of Human Forgetfulness comes in. A big number of credit card users forget the due date for payment amidst busy schedules at work and outside life. If not completely, users default the deadline by atleast a day. This way the credit card companies make huge profits. Just imagine the shopping people do during festival seasons like Christmas and New Year, and the resulting swipes made using credit cards. The credit card industry started the trend of exploiting human forgetfulness, and has been the biggest exploiter till date. But there are other secondary industries which have exploited this weakness of humans. These industries have used this human weakness by getting them subscribe to their services and products using their credit cards. The concept of using credit cards on a daily basis was very common in the Americas and Europe for a long time, but since the past many years, even Asians have started to use credit cards big time. This has made people spend more than they have, and live on tomorrow's money. This way, human forgetfulness has changed the global economy. More on business in my next post. There has been a lot of innovation happening in the areas of business and technology. From observation and analysis its understood that most of the key players in the market have been successful for something that they employed in their approach. This "something" has been in the areas of business case, go to market (GTM), cutting-edge technologies, simplification of technologies and usage, targeting a niche market and many more. The list is an exhaustive one. From a business standpoint, the future business strategies will involve more around human network chains and the tapping certain key points in the humans' thinking networks/patterns. The next generation of business will hugely try to capitalize on the very volume of people using it or even noticing its presence. In a world thats fast changing, man has wanted to see reactions even before something can trigger it (by ways of understanding thinking patterns). In the world of virtual business, we do see how Attention is something that's being exploited. This is not something new happening. We've seen hoardings being used on the road sides that precisely work on this very concept. Next generation businesses will hugely rely on exploiting the areas of the human mind that was never before used for marketing. Amazon created this new way of selling products by saying "All those who bought this product (X), also bough Y". This created a huge difference to Amazon's sales. Another key feature of the next-generation businesses will be the fact that it would come with zero cost (FREE, in other words). Free is the way of nature. An entire valley can be fertile when its well irrigated by the water flowing down the stream, originating form the mountains. What happens when one obstructs the flow of this stream? The crops that it irrigates, would die! Thats the concept businesses will follow - As long as they (products) are free, its gets used. Once the cost factor steps in, it will die. Chris Anderson has given a fantastic talk about the FREE economy at the recently concluded Nokia World 2007. You can watch this video here. Robert Kraft has never been on an airplane. He avoids elevators at all costs, lest he get stuck in one. He refuses to leave Miami's South Beach -- save for a doctor's appointment or an occasional Marlins game. 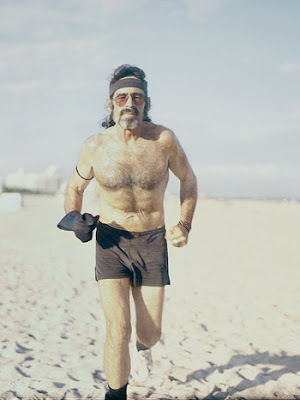 And he hasn't missed his daily run since Jan. 1, 1975, following an identical path from his Ocean Drive apartment to the beach, gingerly climbing over the coral-colored wall that separates the street from the sand. Kraft is a member of a rare and obsessed breed, a streak runner. He runs every day -- weather, sickness, injury or extracurricular engagement be damned. Some streak runners get their miles in before the sun rises, before the kids must be fed and before the boss needs to see that report. Some sneak out while their co-workers are sitting in the drive-through at lunch. Some prefer a night run, when the road is calm and the air cool. The only rule is that you run, every single day, at least one continuous mile. Absolutely no exceptions. Needless to say, this kind of thing can put a crimp or two in a person's style. "It has limited my life," Kraft admits. "I'm a prisoner of routine, but I've become comfortable with it." 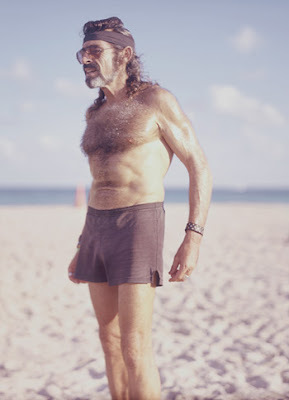 Most afternoons at 4, Kraft can be found, clad in the all-black wardrobe that earned him the nickname "Raven," stretching his quads and back muscles at the Fifth Street lifeguard station on South Beach. In the summer, Kraft gets to his favorite spot closer to 5, giving the oppressive southern Florida heat a chance to burn off so the next hour and 40 minutes or so will be as comfortable as possible. After loosening up for 10 or 15 minutes, Kraft is off. But unlike almost every other streak runner in the world, he's not by himself. Over the past three decades, he has gathered quite a following, a mixed bag of Raven-wannabes who will follow him anywhere, like baby ducklings trailing behind their mama. Tanned and lean, the "Forrest Gump" of South Beach leads his charges north toward Espanola Way, about an eighth of a mile, though the sand makes it feel twice that. From there, the party buttonhooks south and then backtracks along the same route, pushing past the Fifth Street starting spot, all the way down to South Pointe Park, at the southernmost tip of South Beach. They've now run about 2.5 miles, a circuit that will be repeated two more times. After they all catch their breath, it's into the ocean for a 1/3-mile swim, which Kraft himself will pass on if conditions aren't perfect. He has a pretty bad back -- degenerative discs, sciatica -- and the cool water only exaggerates the pain. Another eight miles completed and logged, Kraft will retrieve his gear from the lifeguard station -- the lifeguards gave him a key 18 years ago -- and walk the few hundred steps to his apartment. Here, he will spend the rest of the night and the next morning avoiding any activity that could jeopardize his 33-year streak, which began soon after his songwriting career crashed and burned in Nashville, leaving him angry, frustrated and looking for distraction. At the time, there was an old boxing gym near his apartment and every day he saw the would-be champs jogging on the beach. He joined them for a few miles now and then, until it dawned on him that those few miles on the sand were the best part of his day. It just made sense to keep going. The only tangible reward for Kraft's 95,000 cumulative miles is the No. 11 spot on the United States Running Streak Association's active list. Every day since January 1975, and Kraft doesn't even crack the top 10. As of Nov. 30, Mark Covert, a 56-year-old teacher and cross-country coach at Antelope Valley College in Lancaster, Calif., holds the longest active streak: 39 years, 130 days. In July, Covert eclipsed Bob Ray's all-time streak of 38 years, five days. Second on the list is Jon Sutherland, a college track and cross-country teammate of Covert's, who trails his good friend by about 14 months. "[Back in '69] he wrote me a letter and said that he had run every day for a year," says Sutherland, now a high school running coach in Sherman Oaks, Calif. "So I told him I was going to do it, too." The USRSA defines a run as "at least a continuous mile within each calendar day under one's own body power, without the utilization of any type of health or mechanical aid other than prosthetic devices." Covert, however, has his own, higher standards. The current record-holder has averaged approximately 9.7 miles a day for 14,344 days, a total of 138,639 miles. Of that total, 26.2 came during the 1972 men's Olympic marathon trials. Covert finished seventh in 2:23:35 behind trials winner Frank Shorter, who would go on to win a gold medal in Munich a month later. Covert's shortest run has been three miles, once. His longest, 52 miles. And he once logged 210 miles in a single week. But with a wife, four kids and a full-time job, Covert says he cannot allow his streak to be the focus of his life, to which everyone and everything else must be subordinated. "It's not something that I spend a lot of time thinking about," Covert says. "I run, I put it in the log, and the day goes on. Probably about half the people that know me don't even know that I run. It's not something that I talk about. It's just something I do." Even those tiny slivers of attention that occasionally shine on Covert and his fellow streak runners would not exist but for the USRSA. Indeed, the organization is the only reason many of these runners are aware that streak running exists beyond their own personal obsessions. Run out of Millersville, Md., by retired banker and insurance agent John Strumsky, who himself owns a streak of almost 25 years, the sanctioning body of streak running was born in 1994 when the newspaper Runner's Gazette published a list of 51 East Coast streak runners. The list was compiled by George Hancock, an avid runner himself who first became aware of streak running in the early '90s. Soon after, in an attempt to organize the emerging subculture, he began placing ads in running publications. Six years later, with Strumsky, Bob Ray and Margaret Blackstock (whose 28-year streak is the longest on the list by a woman) Hancock officially incorporated USRSA. Kraft was the first to pay membership dues. There are now 160 names on the active list, the last few with streaks of less than two years. "We have everyone from Olympians to health joggers who can't even break a 10-minute mile," Strumsky says. "We have guys who do [the] Boston [Marathon] every year and people who have never run a race." The organization operates on the honor system, though mileage logs can be requested and reviewed if the veracity of a streak is in question. In the early years, a few runners were booted off the list, but mostly the trust seems well placed. Consider David Hamilton, No. 8 on the list with a streak that began Aug. 14, 1972. Suffering from a pinched nerve that practically prevented him from even standing, Hamilton, in 1992, had to abort his daily four-miler after less than 400 yards. After a few hours of stretching, rest and ibuprofen, Hamilton steeled himself for a second try. Instead of his usual route, a neighborhood trail, Hamilton headed up to the local high school's track and laboriously waddled through 16 laps. Running through pain, illness and injury is the common bond of streak runners. They all have their stories of broken bones, scoped knees, pulled muscles and torn ligaments. Ronald Kmiec, a concert pianist in Carlisle, Mass., was wrapping up his run one day in 1977, less than two years into his 31-year streak, when he was attacked and savagely beaten by a neighbor with whom Kmiec says he had engaged in a long-standing dispute. Despite 54 stitches in his scalp, a broken rib and several broken facial bones, Kmiec convinced his wife Leslie to drive him to a neighboring town the next evening for a stealthy, if quite slow, mile. During a two-year stint with the Peace Corps in Quito, Ecuador, Stephen DeBoer, a Rochester, Minn., dietitian who sits in fifth place with a 36-year streak, did his daily runs along a little-used railroad track. After a dog took a hunk out of his left leg, just above the knee, DeBoer ran with a whip for the next 20 months. Every day he saw the same dog, though it never bit him again. Long before his pinched nerve, Hamilton was sitting in a movie theater with his then-wife when he realized the combination of the movie and the dinner they had planned to attend afterward would end long after midnight. And he still hadn't run. "It was a martial arts movie called 'Hot Potato,' and it was supposed to be funny, but wasn't, and it wasn't good martial arts either," Hamilton says. "So I just told her I'd be back in a bit, and I did a quick three-miler." Not surprisingly, Hamilton isn't married anymore, but he swears it wasn't the streak that came between him and his wife. At times, a streak can be a burden so heavy the runners can't sustain it by themselves. At such moments, it helps to have a wife like Laurie Gathje. Laurie and Steve Gathje have been married for 25 years, a full 10 years less than he has been running every day. Right now, he's ninth on the list, but his name likely wouldn't be anywhere near the top if it weren't for the latitude Laurie gives Steve and his streak. At 5:30 in the morning on July 14, 1985, Laurie's water broke. The Gathjes' second child, Sarah, was on the way, and although Steve had squeezed in a run at the birth of his first child, Joe, there was no telling how long this one would take. "I got dressed and was ready to take her, when she stopped me and said that I better run now because this might be a while," says Steve, an actuary in Overland Park, Kan.
"I knew they might wait for 24 hours and that would break his streak," Laurie remembers. "I didn't want to be responsible for that." The streak is a great source of pride in the Gathje family. On its 25th anniversary, they celebrated with a party. Friends and family toasted Steve and his streak. Laurie presented Steve with a pair of bronzed running shoes. But for all the sacrifice, all the waiting to give birth, all the years of driving to Steve's office every Friday to pick up the week's worth of sweaty shorts and dirty socks he accumulated running to and from the office each day, Laurie has no desire to see the streak end. Actually, she's a little scared of what might happen when it does. "It's his release from everything in life," she says. "We're going to have to find him something else to do." Good question. Virtually all streak runners answer with variations on the same theme: the need to challenge themselves. For many, their identities are inextricably connected to their ability to get up and run every day. The actual rankings, the races, the anniversaries ... those are all secondary, mere byproducts of the euphoria that comes with putting in the miles. "It comes down to amazing one's self and maybe now and then a few other people," Steve Gathje says. "Or maybe I'm just slightly crazy." On a cool, wet Thanksgiving morning a few weeks ago in Andover, Mass., Ron Kmiec, the concert pianist with 34 Boston Marathons under his belt, stepped to the starting line of the Feaster Five. Since his best time ever for the distance is 33:18, Kmiec anticipated easily covering the five-mile course in less than 40 minutes. The race begins with an immediate climb and Kmiec felt sharp chest pain almost from the opening gun. His constant companion for the first three miles, it lessened eventually, but never fully subsided. To keep his focus through the pain, he forced himself to concentrate on his breathing and pace, finally finishing with a 7:57 mile. Still, his 42:38 was the slowest he'd ever clocked in his eight years running the Feaster Five. Though the pain continued, he ran a mile the next day, and another two miles the day after that. After he plodded through a three-miler Sunday at the absolutely glacial pace of 10:38 per, Leslie had seen enough. She insisted Kmiec have himself checked out. An EKG on Monday (he made sure to get his mile in before the test) confirmed Kmiec had suffered a heart attack. On Nov. 28, Kmiec would have celebrated 32 years of running at least a mile every day. Instead, he was in a bed at the Lahey Clinic in nearby Burlington, where doctors performed an angioplasty to repair blockage in his left circumflex coronary artery. Unwittingly, Kmiec had tried to put his streak's survival ahead of his own. Luckily, his wife didn't let him. "She saw something was going on," he says. "Without her, I would have just kept going." After coming face to face with his own mortality, Kmiec has come to accept the end of his streak more peacefully than he ever imagined. "It never felt like it was a millstone," Kmiec says. "It was a normal part of every single day. I'm surprised I'm not having a psychological breakdown. It happened. I wish it didn't. I wish I could have figured out some way around it. But no, the gun's not loaded or anything." Doctors have told Kmiec that running actually saved his life, that his heart was strong enough to survive the blocked artery. And when the doctors clear him to run again, Kmiec has every intention of getting back on the road. He has run in 34 consecutive Boston Marathons and isn't planning to give up two streaks in a year. ALL GOOD THINGS MUST END, RIGHT? Back in Miami, Kraft gives at least lip service to ending his streak on his own terms. At his current pace, the 100,000-mile mark should come around March 2009. It's a nice round number and as good a time to end as any. Priscilla Ferguson, Kraft's girlfriend of 10 years, has heard all about 100,000 miles, and pardon her if she's just a bit skeptical. "I'm surprised he's actually able to discuss ending it rationally," she says. "I just don't think he will ever be able to stop. I've heard him call it a healthy addiction." Almost 33 years ago, Robert Kraft started running out of anger, pissed that a song he says he wrote made somebody else rich. When he ran, he was a little less angry. Maybe when he hits 100,000 miles, he'll find the peace he has been chasing. If not, you'll know where to find him. This is a part of the Share What You Learn (SWYL) series of articles in my blog. Yet another learning today. Having been a part of many groups (both, in the real world and the virtual world), I've had a lot of good experiences and learnings. Today was the first time in life that I experienced something that makes me share it with you. Leadership qualities refer to all qualities about oneself that the world outside can feel and understand. As a leader, one needs to be amidst groups of people in more than an occasion. This requires one to be have mastered both leadership and group etiquettes. There are many sites in the internet that talks about how one needs to behave in a group. But here, I thought of sharing an experience of how one should NOT behave in a group. I've been a member of a big virtual group of entrepreneurs in the Silicon Valley of India - Bangalore. The group actively discusses issues and activities at Startups. The group does sometimes get mails from members about vacancies in their Startups. There was a vacancy posted at a Startup in Chennai at SVLinks, and I had posted it to this virtual group in Bangalore. Any idea what the reaction was? There was this gentleman Mr.Venga (name changed), who shot out an email to the group with a one liner "Can someone get this guy and his updates off this list?". Well, that was a shocking reaction to me. Firstly, the group did talk about job openings, but was apprehensive to my posting (Don't know why!). Secondly, it being a group of entrepreneurs, I expected some decency in the way it was put. One doesn't address a person who has had a exceedingly good professional career with singulars. "Apologies for posting that job. I realized it just after I hit the send button..it was too late. I was just concerned about the way people addressed me. Any more thoughts, please mail me personally. "Don't let the bozos grind you down. The bozos will tell a company that what it's doing can't be done, shouldn't be done, and isn't necessary. Some bozos are clearly losers--they're the ones who are easy to ignore. The dangerous ones are rich, famous, and powerful--because they are so successful, innovators may think they are right. They're not right; they're just successful on the previous curve so they cannot comprehend, much less embrace, the next curve. In the above point, Guy referred to innovators. But a good leader also needs to have this quality. This is just one drop of what one needs to know from the ocean of Leadership qualities and etiquettes. The technology landscape in India has seen a radical change in the past two years. With many of the Multi National Companies setting up shop in India and the growing economy, innovation has been most sought after in both the product and services domains of Information & Technology industry. With seasoned entrepreneurs like Sabeer Bhatia actively involved in the creation of new products and companies, the community of Startups in the Information & Technology industry has also been growing at a steady pace. With so much of innovation happening around, have you ever wanted to take a look at them first hand? Have you ever wanted to showcase your innovation (product or service) to the world? HeadStart is a conference thats happening from 18th to 20th January 2008 at Bangalore. Its a conference thats aimed at showcasing the state-of-the-art products and technologies developed in India. It also features a list of eminent speakers like Ram Shriram - Managing Partner at Sherpalo Ventures and Board Member at Google Inc., Venki Nishtala - CTO of Rediff, and more. The nominations are currently open for product demonstrations at HeadStart in the segments of Consumer services, Mobility & Communications, Enterprise applications and Development tools, and Silicon and Consumer devices. Its going to be happening at JN Tata Auditorium, Indian Institute of Science, Bangalore. I'm going to be there. If you are interested do register and lets meet up. The central nervous system is a very complex system formed by a network of complex neurons.While comparing a working of a set of neurons to a human physical activity, its appropriate to understand that the neurons also get tired! When we do long hours of work, we tend to get a good sleep, and so do the neurons. I'm sure you are wondering what I'm trying to talk about here. Read on.. Even the most creative people have times when they feel that their mind is totally stiff and that their thoughts are blocked. In my opinion, these are the times when the brain slows down due to over load, stress and strain. Thoughts and Creativity in the human mind is like a sinusoidal waveform - has positive cycles and negative cycles. Sometimes the human mind is highly creative, while at other times the same human mind slows down. From personal experiences, my observation is that this (mental tiredness and retarded Creativity) needs to be given the due respect. The mind is the master of the body, and controlling the mind is good (and, its possible! ), but should not be exercised too much. This can lead to adverse effects of continued mental stress and depression. The above list can go on for miles. Well, although the above list of creativity boosters can be a long one, they do the same work - Refreshes (F5!) the mind. Medically, they improve blood circulation to the brain and makes it active. After a break like the above, mind gets atleast 20% more creative. This is based on repeated personal experience. I generally go for a short 3 mile run. Trust me, the state of my mind after I'm back from the run is really something to cherish. A small advice to readers is not to indulge in any activity that involves high physical activity (viz., an 8 mile run). This can in turn make your mind tired (or too relaxed!) and you might end up sleeping. For those interested in taking a plunge into the ocean of creativity and art, here is something really intresting. Its Sketchibit out there. Sketchibit?? What does that mean?..I'm not quiet surprised to see this question floating at the top of your mind. Sketchibit is a combination of two English words - "Sketch" and "Exhibit". Its a platform for people like You and Me to vent out and showcase those amateur/ talented artist in us. Its on a Beta phase currently. Well, all of us were given a box of crayons (for sure!) during our kindergarten days! If you've not realized the artist in you, we are here to help you Sketchibit your artistic talent. Did you ever realize those moments when the pen in your hand scribbled something in the scrap paper while you were busy on the phone? Remember the time when you helped your kid complete a drawing assignment? Remember those school exam days, when you drew those funny pictures in your answer book (not knowing what to answer!) ? The days during Halloween when you painted your face? Remember the times when you painted your house walls with some new designs? Yeah! There is indeed a unique artist in you. Why don't you share your creativity with others? Here, we offer you the stage to Sketchibit your artistic talent! The art need not be just something that you did on the paper. It can be the one you painted on your face, on the wall, on the car, your little dog kennel, on your neighbor's car, just anywhere! Sketchibit works best on Firefox browser. The team is working on more features, and lets hope to see more features in the days to come. "Never let failures put the brakes on your Ferrari Confidence! Drawing and painting has been for long known as the outcome of the creative right brain. There is a creator in each one of us, but the differentiating factor has been the extent to which each one uses it. Based on personal experiences, its the environment that matters the most. When the brain is subjected to an environment that continuously exposes a myriad of different activities, the right side starts to develop. A simple analogy of a creative mind is to a creative art. The more the colors, shapes and shades are used, the more attractive the art becomes. A quirky stick figure can be made more attractive when painted with good colors. Amongst various other forms of creativity sources, Art is a very key component. We all were given a box of crayons during our kindergarten days. Most of us have the habit of fiddling with the pen and a paper during a telephone call or a conversation. But we never notice the outcome of what we did, until someone else points it out! There are days when we sit with kids to help them with their art classroom assignments. Did you ever realize how light your mind becomes at the end of this exercise? Art potentially acts as a stress buster, and hence creates space in the right side of your brain to think creatively. Creativity needs space! I'm not talking about physical space, but mental space. When the brain is preoccupied with thoughts and conflicts at work or with other personal issues, the brain gets tired and hence loses the chance to develop creativity. Where does creativity come from? How can one person be so creative and another person appear to be uncreative? The source of creativity really stems back to the brain. Prior to the beginning of the twentieth century little was actually known about the brain. In the late 1950's and early 1960's some significant research was conducted by Roger Sperry. Sperry's work, which later earned him the Nobel Prize for Medicine in 1981, clearly showed that the brain is divided into two major parts or hemispheres, the right brain and the left brain. His research also identified that each of the parts of the brain specializes in its own style of thinking and has different capabilities. The left brain is associated with verbal, logical, and analytical thinking. It excels in naming and categorizing things, symbolic abstraction, speech, reading, writing, arithmetic. The left brain is very linear: it places things in sequential order -- first things first and then second things second, etc. If you reflect back upon our own educational training, we have been traditionally taught to master the 3 R's: reading, writing and arithmetic -- the domain and strength of the left brain. The right brain, on the other hand, functions in a non-verbal manner and excels in visual, spatial, perceptual, and intuitive information. The right brain processes information differently than the left brain. For the right brain, processing happens very quickly and the style of processing is nonlinear and nonsequential. The right brain looks at the whole picture and quickly seeks to determine the spatial relationships of all the parts as they relate to the whole. This component of the brain is not concerned with things falling into patterns because of prescribed rules. On the contrary, the right brain seems to flourish dealing with complexity, ambiguity and paradox. At times, right brain thinking is difficult to put into words because of its complexity, its ability to process information quickly and its non-verbal nature. The right brain has been associated with the realm of creativity. Our educational system, as well as science in general, tends to neglect the nonverbal form of intellect. What it comes down to is that modern society discriminates against the right hemisphere. Take the activity of balancing your checkbook. The left brain engages in a very systematic, sequential and exact approach to getting the job done. The left brain strives for accuracy in making sure the balance balances. If the right brain were in charge of this activity, the right brain would probably be content to round up or down to the nearest dollar amount: an approach that is unacceptable to the left brain. Now let's consider another activity: driving on the interstate. This is clearly the domain of the right brain: spatial relationships, the ability to process information quickly, and to see the whole picture from all of the parts. If the left brain were in charge here, you would probably hear something like this: "Now the truck is approaching on the right entrance ramp at a speed of approximately 35 miles per hour, while the white sports car is approaching in the left lane, at 70 miles per hour, swerving slighting in and out of the right lane, and up ahead is a slowly moving car, traveling about 20 miles per hour, that keeps putting on its break lights every ten or fifteen seconds……" As you can tell, this style of processing information is too slow. The right brain takes over and quickly assesses what has to be done and reacts accordingly. A man should learn to detect and watch that gleam of light that flashes across his mind from within, more than the lustre of the firmament of bards and sages. Yet he dismisses without notice his thought, because it is his. This is significant because many times when a person drives a car, the left brain basically checks out and the right brain emerges as dominant. The left brain is "suspended." When this happens, many people experience some of their most creative thinking. Or how about when you take a shower?….or shaving, or jogging, or swimming? Basic repetitive actions "suspend" the left brain and "release" the right brain. These lists extend the above. They are not black and white alternatives. They are ends of a gradual continuum that I shift along. A mind map might stretch these as the diameters of a circle, place dots where my behavior falls, and gradually build a portrait of my way of knowing. Feel free to add your own ideas. The workings of the creative mind have been subjected to intense scrutiny over the past 25 years by an army of researchers in psychology, sociology, anthropology and neuroscience. But no one has a better overview of this mysterious mental process than Washington University psychologist R. Keith Sawyer, author of the new book Explaining Creativity: The Science of Human Innovation (Oxford; 336 pages). He's working on a version for the lay reader, due out in 2007 from Basic Books. In an interview with Francine Russo, Sawyer shares some of his findings and suggests ways in which we can enhance our creativity not just in art, science or business but in everyday life. Q. Has the new wave of research upended any of our popular notions about creativity? A. Virtually all of them. Many people believe creativity comes in a sudden moment of insight and that this "magical" burst of an idea is a different mental process from our everyday thinking. But extensive research has shown that when you're creative, your brain is using the same mental building blocks you use every day—like when you figure out a way around a traffic jam. Q. Then how do you explain the "aha!" moment we've all had in the shower or the gym—or anywhere but at work? A. In creativity research, we refer to the three Bs—for the bathtub, the bed and the bus—places where ideas have famously and suddenly emerged. When we take time off from working on a problem, we change what we're doing and our context, and that can activate different areas of our brain. If the answer wasn't in the part of the brain we were using, it might be in another. If we're lucky, in the next context we may hear or see something that relates—distantly—to the problem that we had temporarily put aside. Q. Can you give us an example of that? A. In 1990 a team of NASA scientists was trying to fix the distorted lenses in the Hubble telescope, which was already in orbit. An expert in optics suggested that tiny inversely distorted mirrors could correct the images, but nobody could figure out how to fit them into the hard-to-reach space inside. Then engineer Jim Crocker, taking a shower in a German hotel, noticed the European-style showerhead mounted on adjustable rods. He realized the Hubble's little mirrors could be extended into the telescope by mounting them on similar folding arms. And this flash was the key to fixing the problem. Q. How have researchers studied this creative flash? A. By using many cleverly designed experiments. Some psychologists set up video cameras to watch creative people work, asking them to describe their thought processes out loud or interrupting them frequently to ask how close they were to a solution. Invariably, they were closer than they realized. In other experiments, subjects worked on problems that, when solved, tend to result in the sensation of sudden insight. In one experiment, they were asked to look at words that came up one at a time on a computer screen and to think of the one word that was associated with all of them. After each word—red, nut, bowl, loom, cup, basket, jelly, fresh, cocktail, candy, pie, baking, salad, tree, fly, etc.—they had to give their best guess. Although many swore they had no idea until a sudden burst of insight at about the 12th word, their guesses got progressively closer to the solution: fruit. Even when an idea seems sudden, our minds have actually been working on it all along. Q. Has brain imaging illuminated the creative process? A. The first such study was done this year but was inconclusive. In the next five to 10 years, cognitive neuroscience will be able to tell us more. Q. What has been learned from historical research? A. Studying notebooks, manuscripts and historical records, we've dissected the creative process of people like the Wright brothers, Charles Darwin, T.S. Eliot, Jackson Pollock, even business innovators like Citigroup's John Reed. We find that creativity happens not with one brilliant flash but in a chain reaction of many tiny sparks while executing an idea. Q. But isn't it the original creative flash that's critical? A. Not at all. Take the first airplane. On Dec. 8, 1903, Samuel Pierpont Langley, a leading government-funded scientist, launched with much fanfare his flying machine on the Potomac. It plummeted into the river. Nine days later, Orville and Wilbur Wright got the first plane off the ground. Why did these bicycle mechanics succeed when a famous scientist failed? Because Langley hired other people to execute his concept. Studying the Wrights' diaries, you see that insight and execution are inextricably woven together. Over years, as they solved problems like wing shape and wing warping, each adjustment involved a small spark of insight that led to others. Q. Are there other generalizations you can make about creative people? A. Yes. They have tons of ideas, many of them bad. The trick is to evaluate them and mercilessly purge the bad ones. But even bad ideas can be useful. Darwin's notebooks, for example, show us that he went down many dead ends—like his theory of monads. These were tiny hypothetical life forms that sprang spontaneously from inanimate matter. If they died, they took with them all the species into which they had evolved. Darwin spent years refining this bizarre theory before ultimately rejecting it. But it was a critical link in the chain that led to his branching model of evolution. Sometimes you don't know which sparks are important until later, but the more ideas you have, the better. Q. So how can the average person get more ideas? A. Ah, here's where we come up against another of our cultural myths about creativity—that of the lone genius. Ideas don't magically appear in a genius' head from nowhere. They always build on what came before. And collaboration is key. Look at what others in your field are doing. Brainstorm with people in different fields. Research and anecdotal evidence suggest that distant analogies lead to new ideas—like when a heart surgeon bounces things off an architect or a graphic designer. Q. Can we become more creative by studying more than one field? A. No one can be creative at everything. You have to work hard in your area, let's say music, and learn everything that's already been done. But multitasking on several music projects at once might foster unexpected connections and new ideas. Q. Are great artists different from inventors and scientists? A. All the research shows that the creative process is basically the same: generating ideas, evaluating them and executing them, with many creative sparks over time. The role of collaboration may be more obvious in business than in writing, but even apparently solitary creators like writers read constantly and talk to one another. In the 1920s and 1930s, for example, J.R.R. Tolkien and C.S. Lewis batted around religious and literary ideas with the Inklings, a group of unfashionably Christian professors who met weekly at an Oxford pub. Q. What advice can you give us nongeniuses to help us be more creative? A. Take risks, and expect to make lots of mistakes, because creativity is a numbers game. Work hard, and take frequent breaks, but stay with it over time. Do what you love, because creative breakthroughs take years of hard work. Develop a network of colleagues, and schedule time for freewheeling, unstructured discussions. Most of all, forget those romantic myths that creativity is all about being artsy and gifted and not about hard work. They discourage us because we're waiting for that one full-blown moment of inspiration. And while we're waiting, we may never start working on what we might someday create. SWYL : What is the difference between Architecture and Design? One of the most widely used words in the IT world are design and architecture. But many a time, these two words have been used wrongly. In some places we see the word architecture being used for a design and vice versa. Each one of us might have had this problem ourselves during early the stages of our IT career. These 6 differences are just the key ones. There are many others that differentiate design and architecture apart from the above. SWYL : What is Architecture? "The fundamental organization of a system, embodied in its components, their relationships to each other and the environment, and the principles governing its design and evolution. "Essential characteristic features, attributes and properties of an object and its surroundings/ environment to address a particular goal or desired To-Be state. The above definition of mine comes from my understanding of architecture and from the degree of discomfort I have in terms of the differences between architecture and design. The IEEE definition of architecture talks about components, their relationships in a given environment, and design principles. There are a lot more than just components, their relationships and principles. Civil Architecture presents a simple analogy to the word "architecture". We can understand that the civil architecture is not all about foundation, beams, columns, roofs and walls. Its also about types of foundation, soil, cement mix ratio in the case of a concrete, diameter of iron rods used for cement concrete, thickness of beams, and so on. SWYL : What is Enterprise? An undertaking, especially one of some scope, complication, and risk. Industrious, systematic activity, especially when directed toward profit: Private enterprise is basic to capitalism. Willingness to undertake new ventures; initiative: “Through want of enterprise and faith men are where they are, buying and selling, and spending their lives like serfs” (Henry David Thoreau). a purposeful or industrious undertaking (especially one that requires effort or boldness); "he had doubts about the whole enterprise"
an organization created for business ventures; "a growing enterprise must have a bold leader"
A design of which the execution is attempted; a piece of work taken in hand, an undertaking; chiefly, and now exclusively, a bold, arduous ,or momentous undertaking. We learn a lot of things in our daily life. In my case, more bytes of data has been traveling into my memory (L) every minute than the number of times my heart beats (H) :-) ! Mathematically I'm tempted to put it as L=(H)^N, where "N" is a variable quantity that varies with the time of the day. Well, the point I'm trying to make in this article is that learning needs to be shared, and I've planned to write a series of Share What You Learn (SWYL - can be pronounced as "Swil") posts. These posts will focus predominantly in the areas of Technology, Business, Leadership, Entrepreneurship and Running (and the related areas). I've been constructing a house these days, and the visits to the construction site has been triggering so many thoughts. Its a good experience to understand first-hand that Civil Architecture and I/T Architecture are so much related. You should see a lot of posts in these lines ("Architecture") in some of my future posts. As we can observe, the attempt has been the create a virtual world that one might want to call as the "Second World". A world where people could collaborate effectively as in the real world today. A place where the limitations of geographical boundaries would not pose an impediment to the level of collaboration. The Social Networking phenomenon in the virtual world is something that attempts to accomplish the above objective. In my opinion, the existing social networking platforms like MySpace, Facebook, Orkut, Hi5, etc can all be compared to shopping malls in the real world. Shopping malls are places where one can find a lot of shops, people, gaming arcades, entertainment zones, etc. A social networking platform like Facebook does just the same thing - It offers a platform for people to share apps (like shops in a mall), share pictures and passion (a substitute to people's presence in a real mall), groups (like meeting people in a mall). But in a real world, its not just malls all over! Malls are located in towns and cities, and cities are located in countries. Open Social of Google just answers this . It offers a platform for any social network platform (mall) to plug into its framework (roads linking malls!) and interact with other social networks as well. When considering the virtual world, one needs to come back to reality to understand the fact that this "virtual world" is going to be possible only when the "real world" (where we exist today) exists. The infrastructure provided by the real world also matters when it comes to accessing the virtual world. Given the fact that different countries have their IT infrastructure in different levels (some with T1 and T2 lines, while the others with Dial-up connections), the resources consumed by the virtual world will matter a lot. A virtual world like Second Life badly fails when we look at this space from a real world perspective. So, is something like Open Social going to be the virtual world that will look like the real world? Well, to be precise, the answer is No. Why? The real world is so perceived to be because we are able to see, hear and feel things around us. While a virtual world today has features that help us see and hear, the missing piece is the third sense "feel" - The ability to feel something. So, can the virtual world really replicate the features that can help us "feel" too? Thats something we will see in the years to come. There has been a lot of research going on in the areas concerning the transmission of smell over the internet. The future is exciting, indeed! I leave it at this. Should the collaborative bug bite me again, I'll talk about this in one of my future posts. CoActLive.com - Wiki with a Difference! When the web world is moving towards increased collaboration, its nice to know about CoActLive.com. I just bumped into this website while reading an article on CIO.com. Its a wiki that offers a secure collaboration environment for various kinds of user groups. I'm now keen to try this out sometime when I get a few minutes. They have a banner in the site that reads "Get your first wiki now. Sign Up! Its Free!". They also have a pricing list that never mentions about this "Free" subscription. Its a bit misleading. Will anyway want to give this a shot. If your biz plan depends on you suddenly being "discovered" by some big shot, your plan will probably fail. Don't try to stand out from the crowd; avoid crowds altogether. Never compare your inside with somebody else's outside. Merit can be bought. Passion can't. The choice of media is irrelevant. Worrying about "Commercial vs. Artistic" is a complete waste of time. Don't worry about finding inspiration. It comes eventually. Should you want to see a nice pdf version of this, go here. These are just six of the key responsibilities that come to my mind. Should you have more thoughts here, do mention them in the comments and your name!...I shall update the post with your comments. 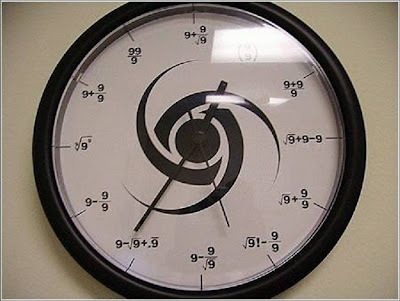 A clock that has only 9's in it.